Managers continue to slide through the waiver wire at alarming rates. Try not to overreact and make rash decisions. Let the underperforming stars get into a groove. Their numbers will normalize. Some outfielders would be better suited to stream for a hot bat. Others need to be replaced just because they are no longer on the field (IL). That is a situation that is affecting many owners, and there is nothing you can do except find a decent replacement as quickly as possible or risk losing valuable counting stats. In this article, I’ll discuss waiver wire targets for the outfield in week 3. This week we cover a few guys that are on a little hot streak while a couple of other players have enticing matchups. Even in the first few weeks, ownership can change quickly. Be quick to check your leagues for their availability. Key points - this list will focus on players who are owned in less than 50% of Yahoo leagues. When you want to chat it up regarding outfielders, prospects, or dynasty leagues, message me directly on Twitter @EllisCan2. Winker was a preseason darling that has quickly fallen in only 34 at-bats. Fantasy managers are a fickle bunch. Winker has started to reward managers for their patience. Not known as a power hitter, he has hit two bombs in the last three days with five total hits during those games. This has raised his batting average to .147. Yep, it is still quite low, but it provides you with an opportunity to get a valuable asset to your team. This week the Reds will be on the road, but they benefit from having a full docket of games. They will head to Cali where they face the Dodgers and the Padres. On the templated schedule is a bout with four southpaws and three righties. Winker will start against the righties, but he might take the bench for some or all of the games against a lefty. Winker is a primary option in the daily rotation game. A flock of Frazier-ites. A small part of the world gathered to the rookie when he followed up his first homer game in the big leagues with his first career two-homer game the next day. It is true both of these games were in Baltimore, but it is still an impressive feat none the less. Some questioned whether he would be able to stay with the team long. In what appears to be fate, the Yankees have lost another bat to the Injured List, assuring Frazier will get consistent playing time for another week or two. He will benefit from playing the entire week at home, assuming he keeps hitting, against Boston and Kansas City. Frazier will face off against five righties and one lefty, which might bring a smile to his face as he is batting .333 with all three of his homers coming against right-handed pitchers. He demonstrated some speed in the minors so don't be surprised if he gets his first stolen base this week as well. Kiermaier has had a successful start to the season. He has hit two homers, stole two bases and brings a .282 batting average. 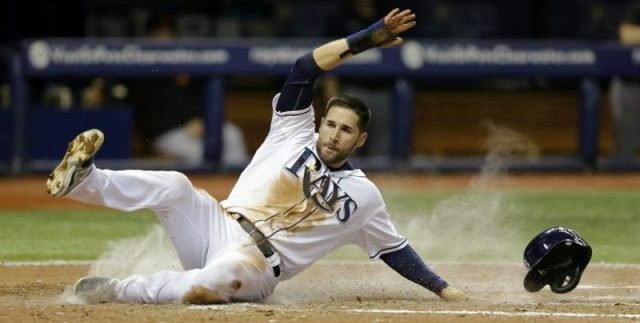 The Rays have been surprisingly successful on offense, and Kiermaier stands to continue to benefit hitting in the middle third of the lineup. The Rays play the entire week at home against the Orioles and Red Sox. While it would generally be a shaky start, the Red Sox pitching has been hittable thus far this season. Kiermaier will face off against four right-handed pitchers and two lefties. The schedule is advantageous as he is better against right-handers (.264) for his career than southpaws (.232). Thus far in 2019, he has stayed consistent and is batting .313 against righties. Even at the bottom of the order, Laureano finds a way to provide for his fantasy supporters. In the past seven days, his primary contribution has been batting average (.333). He still can hit a homer and steal a base at any moment. If he is not going to kill your batting average, you could do worse than speculate on power/speed. The unfortunate part is that Oakland only gets five games on the schedule this week; however, both series are at home. t might appear to be a tough matchup with two games against the Astros; however, he faces the two weakest pitchers in the rotation (Wade Miley and Colin McHugh). Then, the A’s take on the Blue Jays for three games. Thankfully, Laureano faces four right-handed pitchers this week, against which he is hitting .282 this season. If you’re able to stream on the other days, he is a good option this week. The rookie has loved this road trip; in the last week, Lowe has three dingers, six RBI, and a .400 batting average. He has been rather impressive with a .289/.340/.622 triple slash and hopes to carry that into next week. Since most teams are picking on the Orioles and Red Sox, Lowe should have his opportunity to join in on the fun. All six games this week will be at home where he will face four games against right-handed pitchers. Thankfully, left-handed hitting Lowe is batting .278 against them. Take advantage of his hot bat right now as he still needs to improve upon his plate discipline. Lowe currently is chasing a third of the time and not making much contact (60%) while swinging through too many pitches (22%). Again, he is hot right now and facing good matchups this week. Get it while the gettin' is good. What is in the water these days. The fountain of youth is real in KC. Maybe its all the young speedsters running all over the place for the Royals but something has lit a fire in Gordon. On the year he is batting .390 with three homers and 13 RBI. The speedsters are getting on, and Gordon is coming through, hitting .421 with men on base. He enjoys a schedule of five righties and two lefties from the White Sox and Yankees. He's even figured out lefty J.A. Happ, with a .313 average in 15 at-bats against him. Don't get too bold and start him against Sabathia (.171 in 35 at-bats). Renfroe has been impressive at the plate to start the year with four homers and a .282 batting average. He also ranks seventh in the league in average exit velocity (95.8mph). He currently benefits from injuries to a couple of key players that allow him to continue to get more consistent playing time. Take advantage of it while you can. The Padres enjoy six games at home, hosting the Rockies and Reds. With that, Renfroe will face off against at least five right-handed pitchers. Historically, he has struggled against righties (.230), but in a small sample of 2019, Renfroe has not demonstrated the same platoon splits of prior years (.276 in 32 plate appearances). Bruce is doing his best to give your team a head start in the homer category. Of course, then you need to figure out how to re-balance your batting average category. Currently, Bruce has mashed seven homers with 13 RBI and a putrid .203 average. The advantage he has is that he is hitting in the middle of a surprisingly offensive lineup so the runs and RBI opportunities will continue. The next question is his health. He was hampered by an Achilles injury during the week but returned to DH on Friday. Assuming he is healthy, he will have a good slate of opponents this week. Bruce will be at home against Cleveland where he faces three very good righties In Trevor Bauer, Bieber, and Carlos Carrasco. Shockingly, hitters have had some success against them this season. He will likely have better luck when he travels to LA to face the Angels and their below-average right-handed pitchers. Gardner is having a difficult time getting out of the blocks to start the year, with a poor batting average (.200). Of course, he does have back-to-back homers in the last two games. He is mustering an average exit velocity of 87.5mph. POW! I know, not great, but it's pretty good for a 35-year-old. Don't look now but that is also better than Alex Bregman, Nolan Arenado, Carlos Correa, Charlie Blackmon, Michael Brantley, and Victor Robles, all of whom were drafted well ahead of Gardner. The old man has still got some gumption. The critical thing for Gardner is to do his job as a leadoff man and get on base. Unfortunately, he needs to improve in that area as a .298 OBP will not keep him in that spot very long. Even his career OBP (.344) is better than his current performance. This might be the week he gets into gear against five right-handed pitchers (.264 career average). Polanco is progressing well from shoulder surgery, and he is moving from High-A Bradenton to Triple-A Indianapolis. It appears he will be using the full 20-day rehab which would leave roughly two weeks left before he reaches the big league roster. Polanco will not immediately replicate his best days of years past. He will take some time to get acclimated, but it is better to have him on your roster than for one of your competitors to benefit.